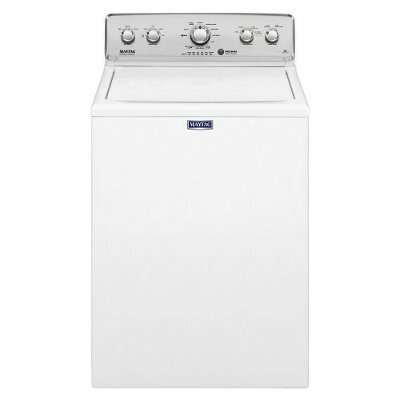 For sale at RC Willey this Maytag Laundry Pair features a top load washer and electric dryer in a white finish. This washing machine and dryer come with everything you need tackle your laundry needs. Bring it home today and enjoy two new appliances that are built and designed to look and work great together. Bring this White 4.2 Cu. Ft. Maytag Top Load Washer from RC Willey home today! With state-of-the-art features like an Auto Sensing Option that fights everyday stubborn stains with the Auto Sensing option, which adjusts the water level for each load to provide efficient, concentrated cleaning and a deep rinse option that rinses away any excess dirt and grime, this washer is designed to satisfy. And with an ultra-large capacity you can do more laundry in each load saving you both time and money as well. 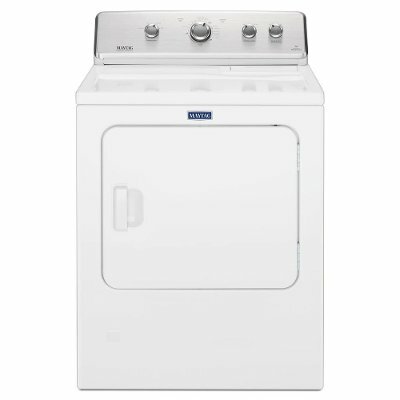 This Maytag Dryer from RC Willey features a large 7 cubic feet capacity drum that makes it easy to dry large loads of laundry all at once. This Electric Dryer is designed to gently dry your clothes keeping them looking their best. 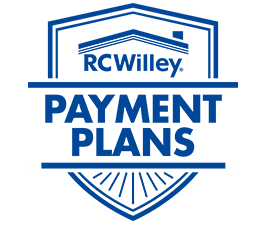 Take the guesswork out of your laundry day with an IntelliDry sensor that monitors inside moisture and air temperatures to help ensure exceptional drying and consistent results.